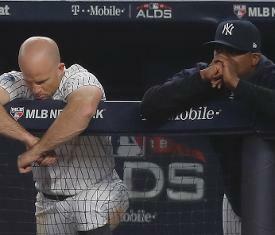 Yankees Postgame Notebook: Worst October loss ever puts Bombers on brink of elimination"
NEW YORK - This Yankees-Red Sox AL Division Series hasn't been kind to historical narratives, and another one went by the wayside in Game 3: it seems as if the Yankees' home postseason magic ran out and was long gone by the time they finished a brutal 16-1 loss to Boston that put them down 2-1 in the series and on the verge of elimination. "No choice but to flush this one," manager Aaron Boone said following the game. "The good thing around today is that it's just one game and, as awful as it was, we have to turn the page, and tomorrow's obviously do-or-die." Luis Severino gave up a lot of hard contact from the start, if only one run - on a two-out comebacker he almost gloved, no less - over the first two innings. But, by the middle of the third, Boston had gotten to Severino for good, plating a pair in the frame on three singles, a sacrifice fly and a fielder's choice. "We didn't have the fastball command that we wanted. We tried to make adjustments during the game, but it didn't go our way tonight," catcher Gary Sanchez said. "When you don't have fastball command, you make it tough on yourself. If you can establish the fastball, the other pitches will be more effective." With the bottom of Boston's order looming in the fourth, Boone sent Sevy out to try to get through one more inning, but two singles and a walk chased him and the bullpen that has been so good wasn't much better; Lance Lynn walked Mookie Betts and surrendered a bases-clearing double to Andrew Benintendi to make it 9-0, and by the time Chad Green finished the frame, it was 10-0 Boston and three different pitchers had surrendered seven runs to 11 Red Sox batters in the frame. "Just hoping he could get something started to get through the bottom of the lineup there, and then we would have Lynn ready for bats no matter what," Boone said. "And then, once the first two guys got on there, thinking Bradley is in a bunting situation, thinking we're going to take him out and go to the 'pen there. It just snowballed on him, and Lance had a little bit of trouble, obviously, coming in there, so it just turned into a really bad inning for us." On the other side, well, the one narrative tonight that did play was Nathan Eovaldi's dominance against his former team. The right-hander spun seven innings of one-run ball, needing just 97 pitches to scatter five hits (and walk none) and retire 11 of his final 12 after the Yankees scored their lone run off him. "He's obviously been tough on us all year," Boone said. "Once he got the lead, he just continued to pound the strike zone. The cutter was a factor, but he mixed in some breaking balls and was able to locate and elevate his four-seamer and his two-seamer, too, which isn't something he does a lot of." To be fair, though, Eovaldi was also helped out by both his defense and video review. In the second, Didi Gregorius was called safe on a bunt, which would have put two on with no one out, but review caught that Didi was out by a half-step, and Eovaldi wiggled out of that inning with two more groundouts. "Once they scored some runs, we just weren't able to climb out of that hole," Aaron Judge said. "We had some good at-bats, but Eovaldi had all his stuff working today, and we weren't able to get any momentum going against him." The next inning, video review upheld a Gleyber Torres infield single, but a sparkling play by second baseman Brock Holt on Brett Gardner's smash got the first of three straight outs, and even in the fourth, when the Yankees scored, it was Gregorius barely beating out a double-play ball that forced Eovaldi to face two more batters in the inning instead of one. "He kept attacking the whole night and did a really good job mixing his pitches. His slider and cutter were effective, so he had a good night," Sanchez said. It was all over but the shouting by that point anyway, and the runs Boston later added off Jonathan Holder, Stephen Tarpley and Austin Romine - yes, Austin Romine, who pitched the ninth - did little more than push the strong bullpen narrative further to the side. And so now, the stakes are clear: win Game 4 tomorrow or the season is over. "That's the beauty of baseball - we wake up tomorrow and it's a brand-new game," Judge said. "All we can do is get ready for tomorrow, and we have to come back strong and send it back to Boston." -On TBS' broadcast, analyst Ron Darling broadcast indicated that Severino was late to begin preparation tonight because of a mix-up as to the game's start time. Severino's response: "Maybe if my pitching coach said that, you can believe it, but he wasn't in the bullpen, so how could he know what I did? I came out 20 minutes before the game like I usually do, and did the same routine I usually do." -Boone's response: "He had his normal routine, no issue with that. He had plenty of warmup. He had done what he intended to go down there and get done, and Larry said he was able to get through his normal routine, where he faces a couple hitters and everything. So it wasn't an issue." -Also, Boone's assessment on Severino's night: "I didn't think he was overly sharp from the get-go. I thought stuff-wise he was okay, but he certainly didn't seem as electric as his last time out. I thought he shaped some pretty good sliders and was mixing in his changeup enough, but I thought the Red Sox did a really nice job of not expanding the zone in those early innings, so that kind of hurt him a little bit." -Romine made his first career pitching appearance in the ninth and will go down in history in another way, too, as he surrendered a homer to Holt that finished the first postseason cycle in MLB history. Here's the catcher on being on the other side of the battery: "I didn't envision myself getting in these playoffs in that role, but I'm here to try to help the guys out there. (Bench coach Josh) Bard came down and asked if I could throw and I said I'd sure as hell try, and I went out there trying to get guys out without giving up runs. Just trying to save the guys we had left down there in the bullpen." -Romine is the first Yankees position player to pitch since Brendan Ryan did so on Aug. 25, 2015, and is just the second in MLB history to do so in the postseason (after Toronto's Cliff Pennington in Game 4 of the 2015 ALCS). Boone on the feat: "It just got to that point. Obviously, you hate doing something like that, but we just felt like we didn't want to use Robbie, Britton, Dellin or Chappy in that spot, knowing we're going to want them all potentially up to a couple innings tomorrow if we need that." -Last word also goes to Boone, and it's this on his choice of relievers in the fourth: "We figured we only had Dellin for an inning tonight. Certainly in hindsight, we could have started the fourth inning with Robbie or something, but we really felt like Sevy could at least get us a couple outs before turning it over to Lynn, and then we could roll out our guys. But we just couldn't stop the bleeding at all."